June 2nd a day that has been on my calendar for over a month. A social media day put together for music educators from around the globe to get together online and motivate ourselves to either make it to the end of the school year or to keep strong throughout the summer. We’re going to keep connected all over the social media world this day from mid morning (est.) to late evening (est.). If you have any questions or any trouble get a hold of me. I’ll be on Google Plus, Twitter, and Facebook for most of the day checking in and helping the activity. -There will be topics for discussion being posted in the music teachers facebook group periodically throughout the day. Log in, head to the group and start talking! Not a member yet? Search for the group and request access before the 2nd! -Check out this schedule of topics that will be discussed during the day! Cocktail Hour, a time to make new friends and reflect on the year we have had. To join the discussion on Twitter make sure to follow the hashtag #musedmot. You can either search for the hastag on Twitter itself or follow the discussion using tools like: Hootsuite, Tweetdeck, Tweetchat. 2. Add the moderator to your circles by clicking the link on http://www.cdwinal.com/musicedmotivationday.htm to go to their page. 3. Each moderator will have a post up asking for you to comment on it in order to be invited to the hangout. The first 9 people to comment will be invited during that scheduled time. If the moderator has the Google On Air hangout feature I will post on the Motivation Day page before then. If they do, anyone will be able to travel to their page during that time to watch the hangout live as it is going on. 4. If you are in a Hangout make sure to log in to Google Plus and be prepared for a Hangout invite on the scheduled time. *Remember these are video and audio chats! Please be prepared to let others see your smiling faces. So, which ever way you do social media join us. Share how you keep motivated to do what we all love to do. We’ll be waiting for you on June 2nd! It has been a whirlwind of a year, projects, working on classroom management, integrating new tools into my teaching. I’m sure most people thought I was nuts when saying it was time to restart the chorus programs. Knowing I had some die hard vocalists in my classes who sat by watching the other students be disciplined and class painfully inch along made the decision easier to give them an another opportunity to be pushed musically and enjoy it.The chorus programs at both schools I teach at died out several years ago so the students I acquired for the programs had never been in a school vocal ensemble before! I also had the motive to recruit talented students for the Middle School Choir who had low numbers for their 6th grade ensemble! Scheduling was the biggest hurdle and of course the first thing that needed to happen. I have a wonky schedule, I arrive at each school every other quarter and see each class in the school twice a week. That usually is upwards of 30 classes a week. My schedules at each school ended up with a recess time practice at one and an after school practice at another. Out of the both I’ve found the after school rehearsal seemed to be well attended, students were completely dedicated and focused. I also was able to connect with parents when they picked up their students. We also became more of a family ensemble, students from different grades that have never met before started talking and eventually became friends. The chorus that practiced during recess had large numbers at first but dropped rapidly when students realized they had to give up one recess time per week only in the quarters I was there. I think I’ll have both after school choruses next year, that way, they can’t escape! lol. Attracting students to the program was another big kicker. I advertised and talked it up like no ones business handing out permission slips right and left just hoping to attract at least 10 dedicated students. I put out signup sheets that became filled with over 100 names, handed out at least 200 permission slips told students the songs we would be singing that there would be a performance at the end. I told everyone who signed up that they had 2 weeks to try it before I put a chain around the door knob and they were fully dedicated to the group. After 2 weeks that 100 went down to 32 completely dedicated students at one school and 23 at the other. Pretty good numbers for a first year program! Choosing the songs was difficult. I wanted something that would be easy for them yet show them off vocally and something that they would all enjoy. Ending up with a pop concert program having them sing; Firework by Katy Perry,Dynamite by Taio Cruz, Rainbow Connection from the Muppets, and Bear Necessities from the Jungle Book. My students literally screamed at the chance to sing Dynamite and Firework which was my hook to get them into chorus. They were able to connect with the repertoire on a deeper level because they KNEW it and all of the songs sounded great when sung by a first year elementary chorus! After everything fell into place and practices ran week after week the performance was a snap. 20 minutes of concert. Short and sweet, long enough to hold parent’s attention. I was a proud wreck before hand but just proud after. They gave me their best and that’s all that mattered. The whole program at each school was well received and supported by teachers and administrators alike with promises for more opportunities next year for us. After surviving my first year with this program it won’t be my last. The laughter, the hugs, the silly stories, the singing, and even that proud teacher feeling in the pit of my stomach standing in the middle of 30 elementary schools singing their hearts out makes this program stand in my heart and on our stage for another year. Students felt a part of an exciting new opportunity that they can stay with until high school. It is a new safe place, a new reason to wake up and come to the school in the morning.Another reason to love and support music. 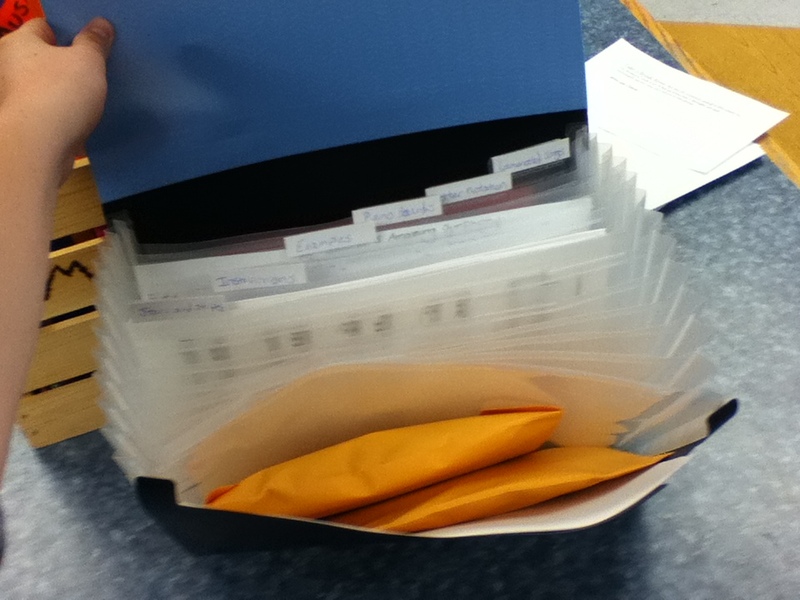 The Bucket to store it all in! 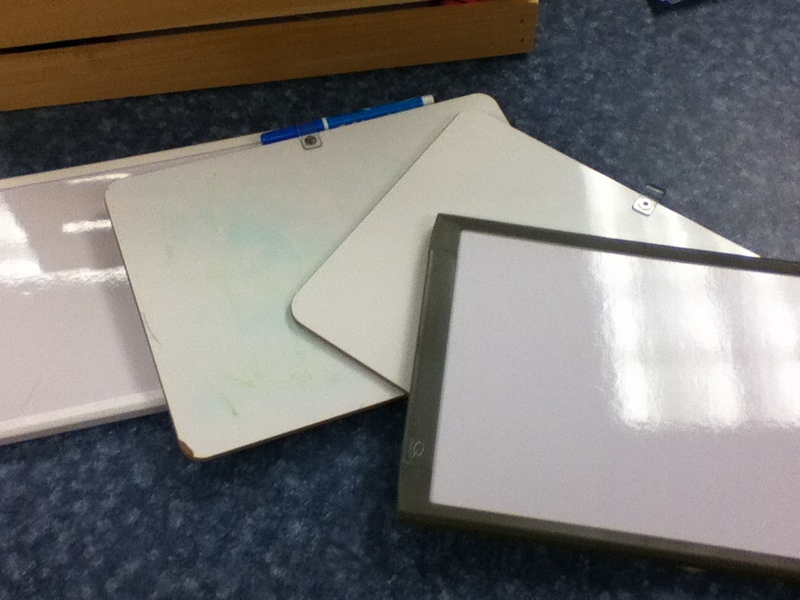 White boards! Great tool for multiple centers my favorite is to have students practicing to write notes and rests on them. 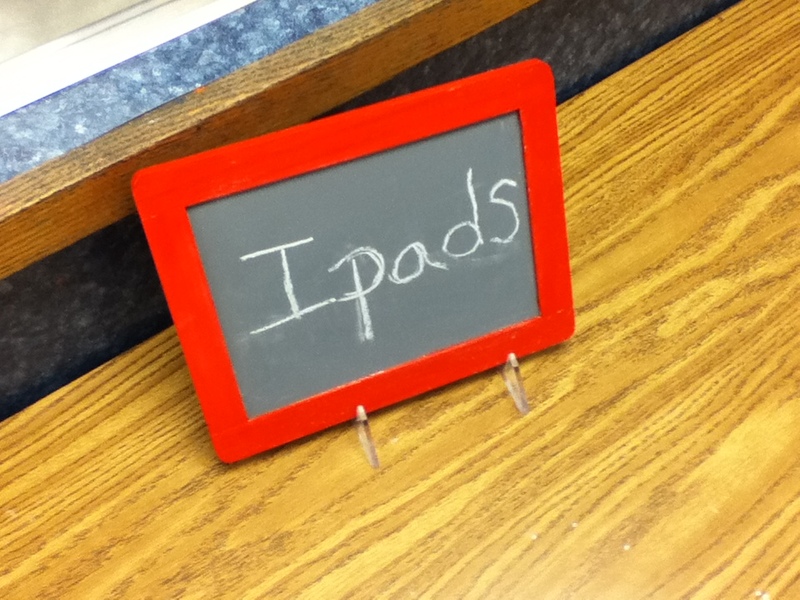 Chalkboards for signs to label your stations. My students would be completely lost about where to go without these! 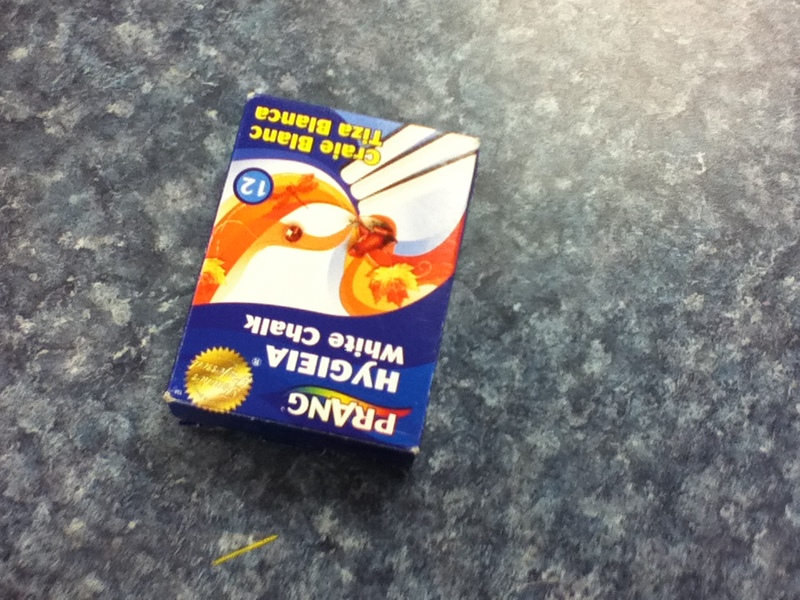 Index cards with holder. I use the cards to write instructions for the station on them and laminate them all. 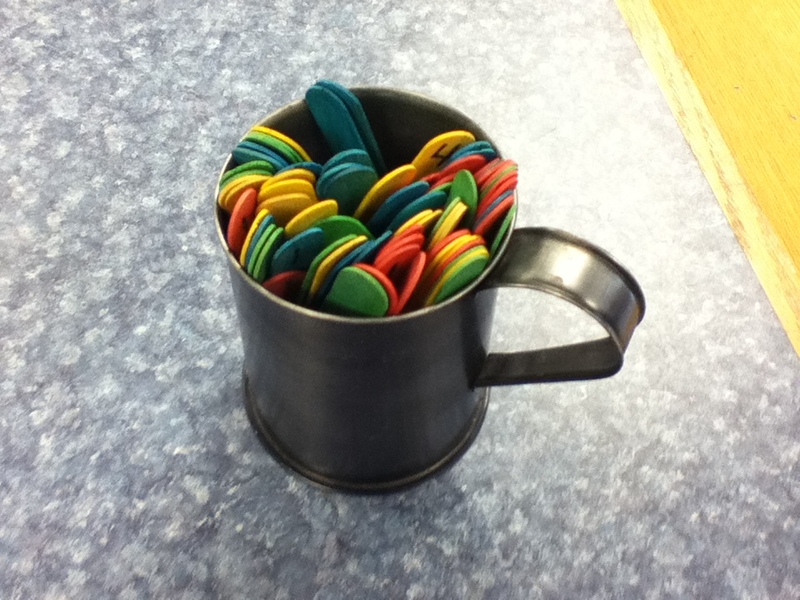 The holder is to keep everything organized! Large file folder to store all of your special examples, scores, pictures, all the extra paper and things you use for centers! 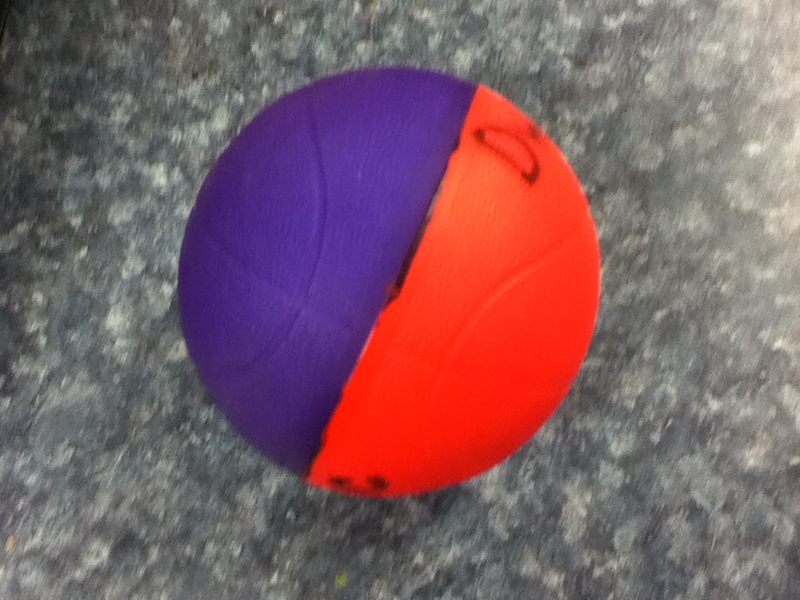 You can’t go wrong with having a soft foam ball, crucial tool in a lot of games! 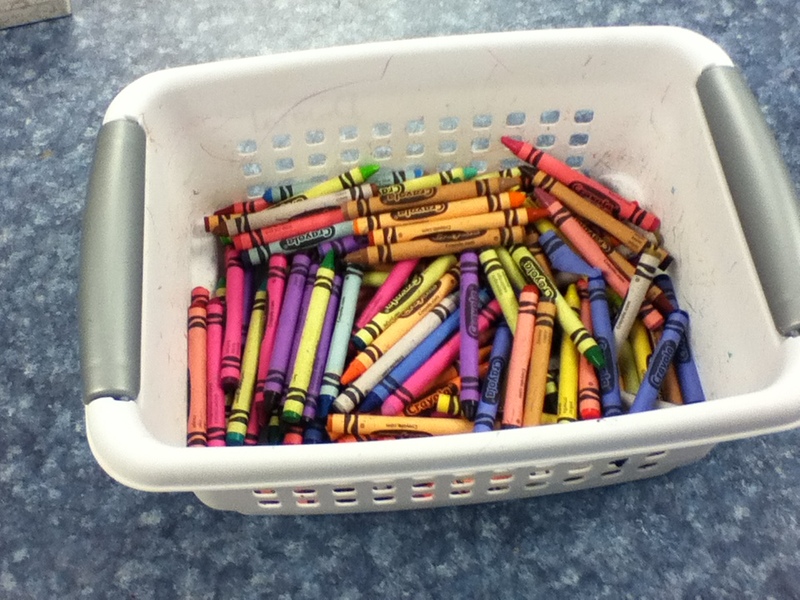 Coloring supplies to color all those pictures and other wonderful things you ask your students to create! 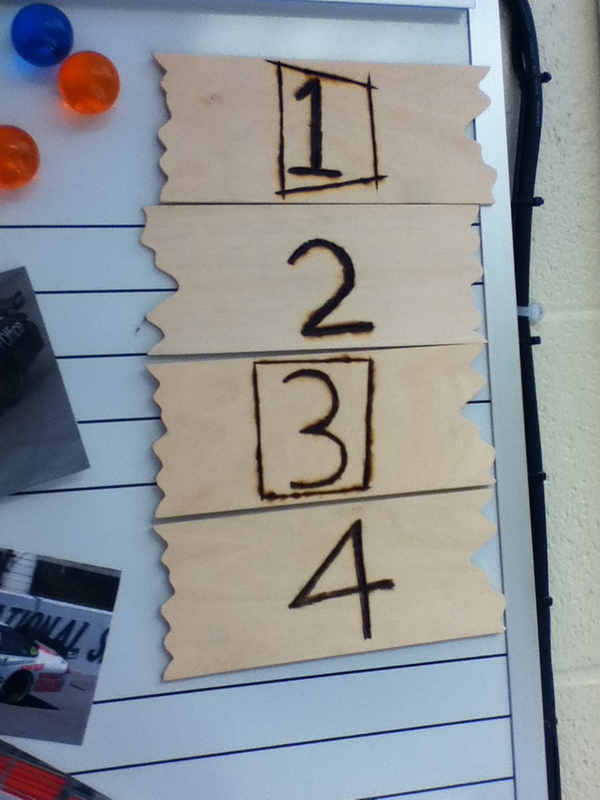 I use different color popsicle sticks for a form of notation. Assign notes to each color and have them start making patterns! 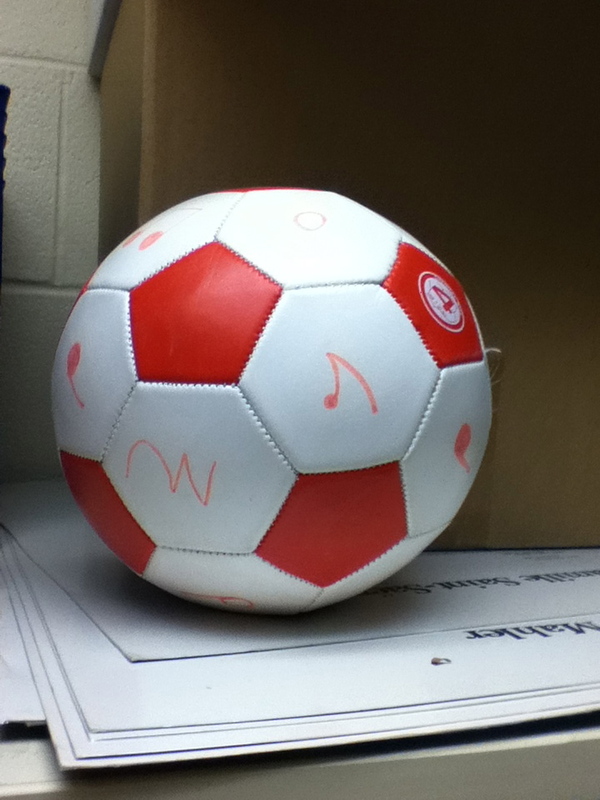 My notes and rests soccer ball. 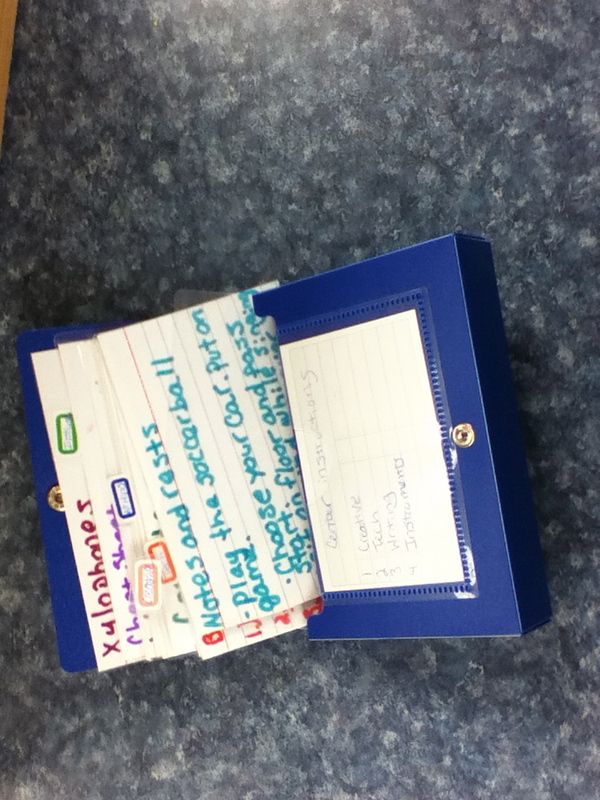 Great way to keep students moving and identifying notes and rests! 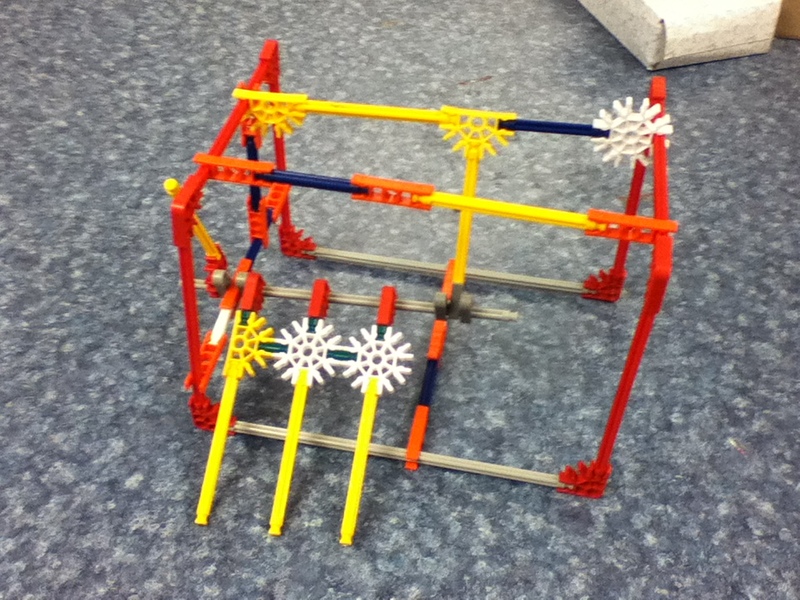 K’nex, Pictured here is one of my student made “chord contraptions” which helps students identify chords. Having a building tool is great. These are hand made signs which I magnetized to my whiteboard. I draw out a map on the board using these signs to help students move from station to station. 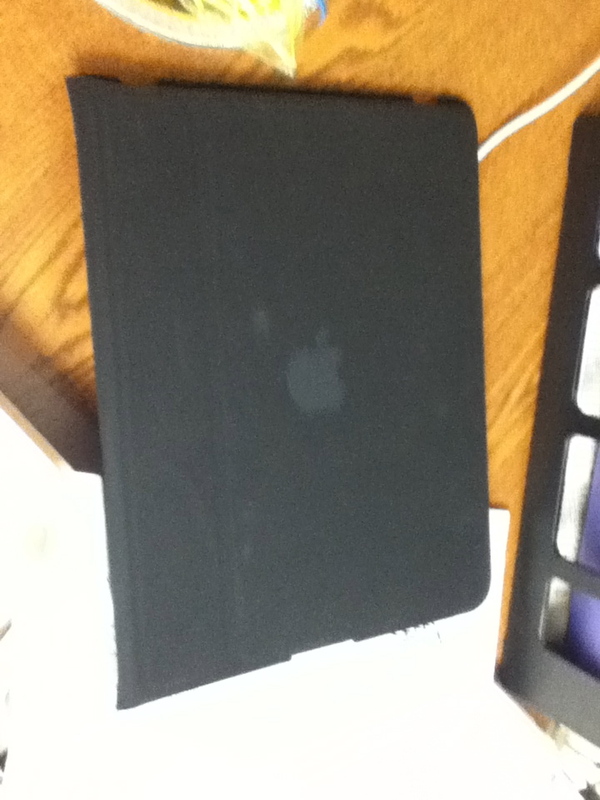 I have a set of 3 Ipads that are amazing. Most of the time my students are composing using Symphony Pro and Garageband but we have some other apps downloaded for them to use as well. Go technology! 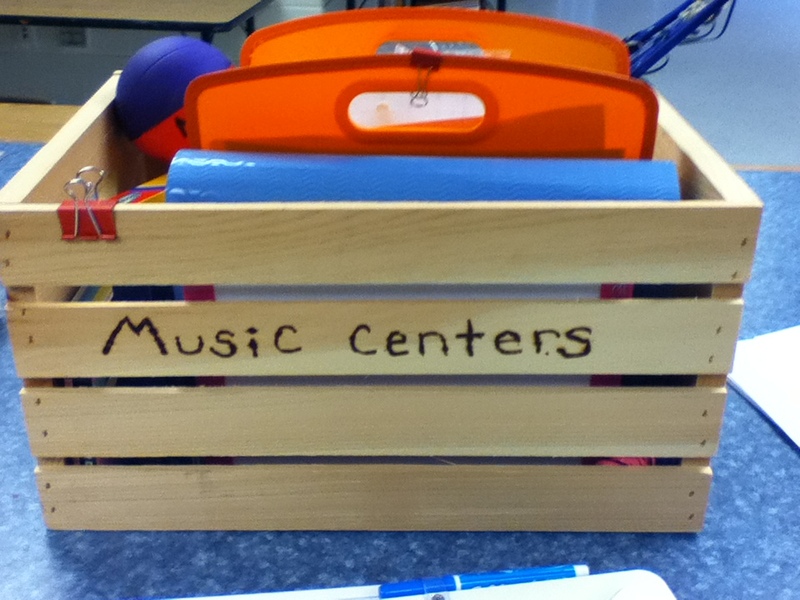 Even have a center where they sit and read music books is a favorite of my students who need a minute to relax. 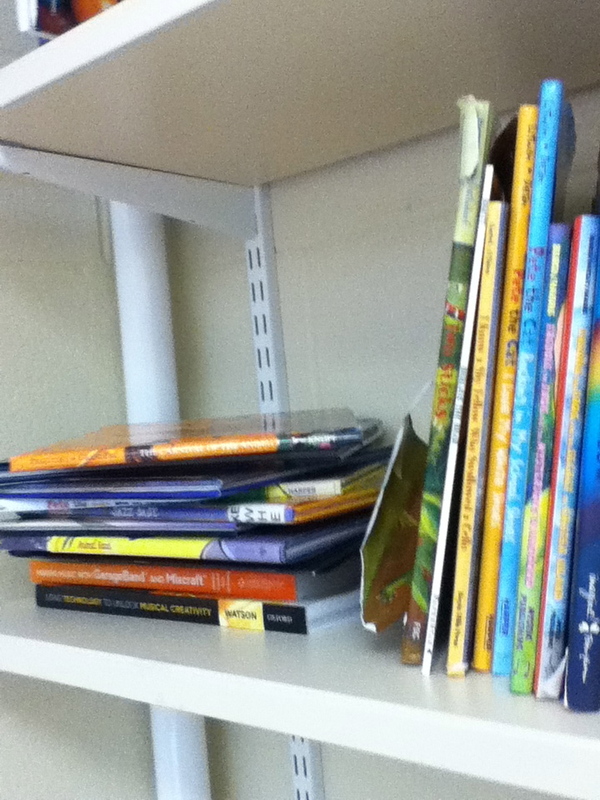 I have a large library of kids books that have to do with music! WHO WHAT WHERE WHEN WHY..But what about the How? After a long yet creativity inspiring day I came to the realization ” It’s so easy to use technology today, it’s not about teaching how to operate it anymore it’s about how to use it in a meaningful way in everyday life” . New technology is handed to us everyday as educators. We’re preached to about who we should use it with, what we should use, where and when it should be used and why we should use it, but what about the how? A big reason why technology is introduced to educators and quickly forgotten is because they can’t figure out how it should be used. We are at that digital age where we all know how to use the technology around us but figuring out how to use it in a meaningful way with our students is the challenge. It’s the whole process of finding that big question or purpose for your students and working through the process. Finding what you want them to know and then inputting the technology into that process so the students use it to help find the answer and creating an everyday life skill that would not only better their experience during the lesson but also help them remember the concepts you were trying to teach. We are in a digital age where it’s not about learning how to operate the technology anymore. Its about showing students that it’s meant for more than listening to music, chatting with friends, or watching media. It’s meant for creation, collaboration, world exploration, and personal growth and development. Who – The who to teach is our students, and our colleagues. What- What technology would be the best tools for the job? Where and When- Where and when would be the best time to integrate technology into your teaching? Why- Why should we use it? HOW- How should it be integrated? How can we get students to use it in a meaningful way?